Photograph. 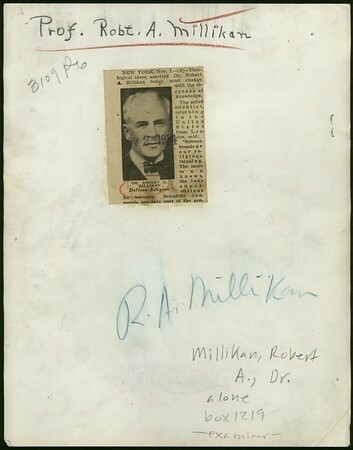 "Dr. Robert A. Millikan defines religion -- New York, Nov. 1 -- (AP) -- Theological ideas, asserted by Dr. Robert A. Millikan today, must change with the increase of knowledge. -- The noted scientist returned to the United States from London, said: 'Science broadens our religious thinking. The more man knows, the less superstitious he becomes. Scientific conquests are only part of the gen'".... -- Examiner clipping attached to verso, dated 2 November 1934.